At the end of 2009, mobile phone subscriptions exceeded the population in 76 economies; in two economies—the UAE and Montenegro—there were more than two mobile phone subscriptions per inhabitant. How can the number of mobile phone subscriptions exceed the population? Having more than one subscription. Some users opt to have more than one subscription perhaps because they want one personal number and one business number, or they have one voice and one broadband subscription or they want to avail themselves of cheaper calling rates for on-net calls. Double counting. Some users may have stopped using one mobile network and switched to another but the original operator continues to report them as active. Machine subscriptions. A growing number of devices ranging from Automatic Teller Machines to beverage dispensers use mobile networks to transmit payment information. 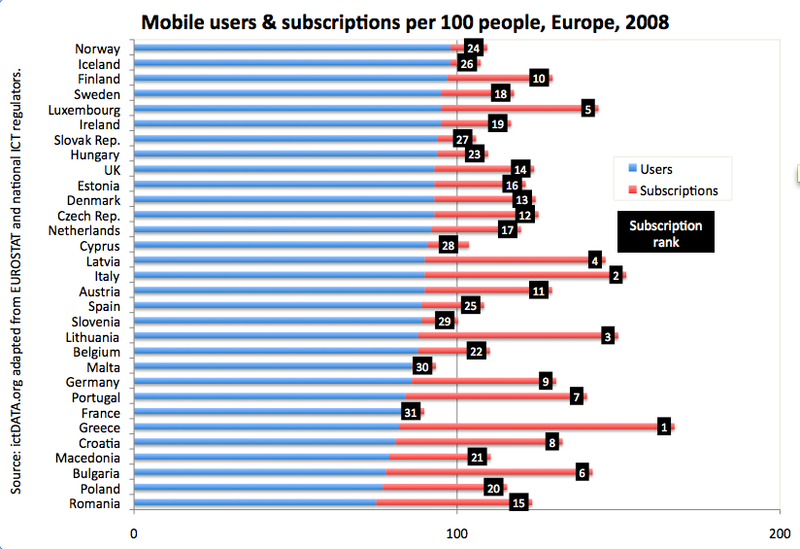 Using mobile subscription data to compare countries can be misleading. Take Europe, where a special survey was conducted in 2008 to determine the number of people between the ages of 16-74 who use mobile phones. Iceland and Norway occupied the top two positions yet they only rank 26th and 24th respectively in mobile subscription penetration (out of 31 countries). On the other hand, Greece and Italy, which rank 1st and 2nd in mobile subscription penetration, only rank 26th and 15th in mobile user penetration. It is undoubtedly better to compare mobile performance using the percentage of people who use a mobile phone but most countries do not compile this data. Another alternative is to use the percentage of households with a mobile phone where the availability is better but still not as complete as mobile subscription data. EUROSTAT. "Special module 2008: Individuals - Use of advanced services: Use of mobile phone" in Information society statistics at http://epp.eurostat.ec.europa.eu/portal/page/portal/information_society/data/database.